One Word explains how to simplify your life and business by focusing on just ONE WORD for the entire year. The simplicity of choosing one word makes it a catalyst for life-change. Clutter and complexity lead to procrastination and paralysis, while simplicity and focus lead to success and clarity. 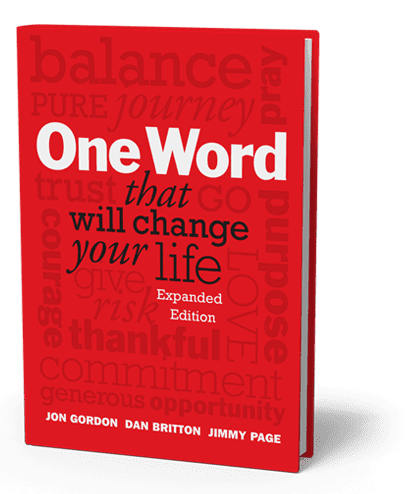 By celebrated authors Dan Britton, Jimmy Page, and Jon Gordon, One Word That Will Change Your Life shows you how to cut through to the core of your intention for the next year. It offers an action plan and simple process to discover your word for the year. It also explains how your one word will impact the six dimensions of your life—mental, physical, emotional, relational, spiritual, and financial. In 1999, the authors discovered a better way to become their best and live a life of impact. Instead of creating endless goals and resolutions, they found one word that would be their driving force for the year. No goals. No wish lists. Just one word. Best of all… anyone, anytime can discover their word for the year. Join thousands of people and hundreds of schools, businesses, churches, and sports teams who have found their one word… and discover how to harness the transformational power of One Word. The book includes a personal Action Plan and simple process to help you discover your word for the year.